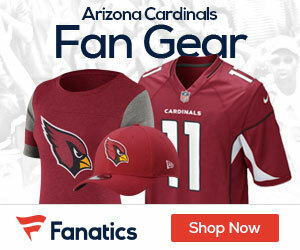 Arizona Cardinals wide receiver Larry Fitzgerald suffered a lung injury and was spitting up blood on the sidelines during Sunday’s 23-20 overtime win over the Seattle Seahawks, Fitzgerald’s father, Larry Fitzgerald Sr, reports. According to Kent Somers of The Arizona Republic, Fitzgerald underwent x-rays after the game and there were not fractured ribs or punctured lungs. Fitzgerald could have a chest CT scan on Monday. After catching one pass for one yard in the first half, Fitzgerald caught eight passes for 148 yards after the break, including three receptions for 36 yards on the Cardinals’ game-winning drive in overtime.